On Thursday 03rd September I went to the National Film Theatre here in London (except that it is no longer quite called the National Film Theatre: its three cinemas are still called NFT 1, 2, & 3, but the whole complex is now either BFI South Bank or BFI London – I always forget which) for an evening of Joseph Cornell films. There was a programme of his early collage-films and a programme of his later films made in collaboration with younger cameramen, with little talks before each and an interval between. The first half should have opened, but from a technical mix-up ended, with the world premiere of a film recently discovered among the archives of the Museum Of Modern Art in New York (bequeathed a mess of Cornell's reels), from probably some time in the 'forties, and now given the title 'Untitled (The Wool Collage)'. I have a little ritual (dating back to a Werner Herzog retrospective of 2001 or 02) whereby if I go to see a film by myself (and almost invariably it is by myself) at the NFT (1, 2, or 3), then I will afterwards get a brandy from the bar, take it over to the Thames (twelve seconds walk), and drink it looking into the river. The first time I did this I got the marvellous feeling that I could be in almost any major city, at any point during the last few hundred years, looking into a river, drinking this drink, and it would feel exactly the same... So since that first time I've continued with the ritual with the brandy by the river, and that same old feeling has never once failed to return to me... Anyway, this time, it being a double-bill, I enacted my brandy-ritual in the interval, straight out of the Wool Collage. As I sipped my brandy, and gazed into the dark waters, and thought about the films I had just seen, I began to contemplate the possibility of making my own films... I have previously, from time to time, had thoughts that I might make films, but had always been put off by two major stumbling blocks: (1) I am hopeless at anything technical, and (2) I know that, me being me, even if I did manage to make films I know I would never realistically get around to promoting them and getting them seen... But here were Joseph Cornell's films, and I know that J.C., while knowing a thing or two about editing, shied away from even contemplating touching a film-camera himself on the grounds of its being too technical for him, and here indeed was the Wool Collage, receiving its premiere after seven decades of him evidently not expending a lot of effort promoting it... And so, considering these things while sipping at my brandy-ritual brandy, I suddenly resolved that there was no excuse, after all, for me not to make films! I have a little digital camera which can shoot videos (I can't help feeling that digital is terribly unromantic compared to real film, but in view of my technical and indeed my economic incompetence it is maybe the only realistic way for me to proceed...) I said to myself, I'll have to learn to edit, which surely cannot be that difficult, and then I'll be able to make films. But after thinking about it for a day or two, I had a better idea. I would not learn to edit, in fact I would make a point of not learning to edit, and even impose it as a rule on my films that they should not be edited, but instead I would have to design my films in such a way that they could be filmed in one single take (title cards and everything – it seemed very important to me that there should be title cards in order to make my things films and not just digital videos). I was extremely pleased with this resolution, for two rather different reasons: (1) I would spare myself the potentially massive headaches of having to edit great piles of footage – I always think of Dennis Hopper making 'The Last Movie', where he shot dozens of hours of material and then had to spend more than a year shaping it into a film – I didn't want to put myself in that situation! I would instead either end up with a completed film upon pressing the STOP button, or else throw the take out forthwith – and (2) by having this no editing constraint imposed as a constant condition on all of my films, I would have a kind of anchor in place, a certain formal unity would be guaranteed and I would be free from there to go off in any direction at all in terms of style, subject matter, etc... And it seemed to me that in film I might find a medium in which I could accommodate all of my various and disparate interests – here I was thinking of Joseph Cornell again, not so much his films now as his boxes, in which he managed to find a natural place for a dizzying range of obsessions – I am horribly aware of the manner in which, in both art and in life, I am always compartmentalizing and keeping separate various parts of myself – I sometimes make new years' resolutions urging myself not to do that – which I fail to keep – but maybe in film, I could find a place to fit everything? From 08th to 11th September I had four days holiday from work (day-job)and set about trying to make films. My first film was going to be called “Prelude”. There was an old bike of that brand-name, whose rusting wheel-less frame had been chained to railings on New Cross Road for many months. I thought that I would film that for about a minute, with the traffic going along behind it, and the traffic noise. I tried it, but it wasn't good at all. It looked terrible, nor did it feel when I tried doing it like the sort of film I actually wanted to make. So I abandoned that idea, and straight away got a bus up the Old Kent Road to Burgess Park, with the idea to just wander around there and look for something to film spontaneously. I decided upon an old tower, or chimney, in the foreground of which stood a wall and thick bushes into and out of which birds were flying. I took out my title cards for the abandoned bicycle film - “Young Mountains presents”; “a film by Duncan Ward”; (…); “The End” - and quickly wrote out a new one with the new film title: “TOWER”. Then I filmed several takes, flipping through the title cards, panning up to a shot of the tower and bushes for a half-minute or so, then down onto “The End” card, hoping to catch a nice combination of bird movements and foliage movements in the breeze. The best take was one in which two crows flew past the tower. It certainly wasn't great, but it felt like my first film. Back at home the same evening, I made first attempts at two more films that I would end up remaking over the next couple of days, “What Happens After Plan Z?” and “New Cross Night”. The next morning, watching back all three films, I realized that I should be better off making silent films. There wasn't supposed to be any sound on the two I had made at home anyway – I had even taken the for me very rare step of not having any records playing while I filmed – but it turned out that the inbuilt microphone on the camera picks up all the workings and whirrings of the camera itself. I didn't want that noise, especially now that I had seen how rough in appearance were the films I was making. My films looked rougher than I had imagined they would (and I could immediately see that they were pretty much doomed to continue looking like that, and that rather than fighting it I ought to just work with it). One really great thing: I was saying above that I felt a little bad about working in digital rather than with proper film – well when I saw the results of my trying to film in digital, I saw that my films were in fact so badly made, so shaky and clunky and poorly-focussed, that they actually ended up looking like real old film! But it seemed to me that, if my films were going to be visually rough and ready, then they ought in terms of sound to be very cleanly silent. They needed a very crisp silence, it seemed to me, to counterbalance and act as foil to the rough visuals. I had a fiddle about with my camera, eventually worked out how to turn the microphone off, and then set about trying to remake my three films as silent. I went back to Burgess Park, back to my tower, and started filming more takes. I soon realized however that I was irrevocably attached to those two crows flying past the tower from the day before, and that I would not be satisfied with any other birds. I was thinking of the Bruegel painting 'Hunters In The Snow' and of the poem John Berryman wrote on it 'Winter Landscape' where he is describing how that momentary scene, captured, is destined to play itself out over and over again, the men going down the hill, the hounds at their heels, and the birds in the trees - “while three birds watch and the fourth flies”. (I was also, less charitably, thinking of a video that was part of an exhibition I once invigilated, which was a montage of images from the Arctic with voice-over of a really terrible Lemn Sissay poem; somewhere in the middle of the video, a few huskies were quite innocently bounding across some snow; and it struck me as rather horribly comical that those poor huskies were doomed for all eternity to bound innocently across that same perfectly fine snow, to the accompaniment of the same perfectly awful poem.) I liked the idea of the crows in my film, similarly, flying past that tower again and again, forever. And of course I realized it was a very poor sort of film, but as I said before, it felt like my first film and it felt like somewhere to start from. So I kept the previous day's version, with the two crows, and with the sound (alongside the unfortunate camera noises, there had been also the sound of someone playing a mouth-organ nearby, whose presence on the soundtrack I approved of, so it wasn't all bad). That would be my first film, bad as it was, and I would try to make better ones in the future. After deciding to stick with the original “Tower”, I wanted to film something new and got on a bus towards Blackheath, hoping to find something to film there. Getting off the bus, I immediately felt attracted by a certain piece of rich grass with a nice row of trees behind it, a couple of houses showing to left, and a clear-formed squarish cloud in the sky above. And so I made my second film, “NOTE FROM BLACKHEATH”. I held the camera in my left hand and filmed my right hand as it wrote out the title cards live on consecutive pages of my notebook. While I was doing this, somebody's dog ran up behind me and stood at my shoulder, watching what I was doing. The titles finished, I panned up to a shot of the grass with the trees behind and held it for a few moments. I was just about to pan further up to film the cloud, when the dog decided to run into the centre of the shot. The actor Klaus Kinski had a manoeuvre known as the “Kinski Spiral” whereby, making his entry into a scene, he would start from a position directly behind the cameraman and spin dynamically into the frame, and this is what the dog did. I am not necessarily suggesting that he or she consciously knew about the theories of Klaus Kinski, but he or she really did seem to be quite consciously acting for the camera, presumably well-used to being filmed by his or her owners. The dog adopted a pose, alert in profile, slap bang in centre-frame, held it for a few moments before being called off by the owner, at which point running off into the distance, whereupon I did pan up to the cloud, then back down to the grass and down to an earlier-prepared “The End” title card on the back of notebook. Back at home that evening, I made my third film, and perhaps my first good one, a silent remake of one of those attempted the night before, “NEW CROSS NIGHT”. 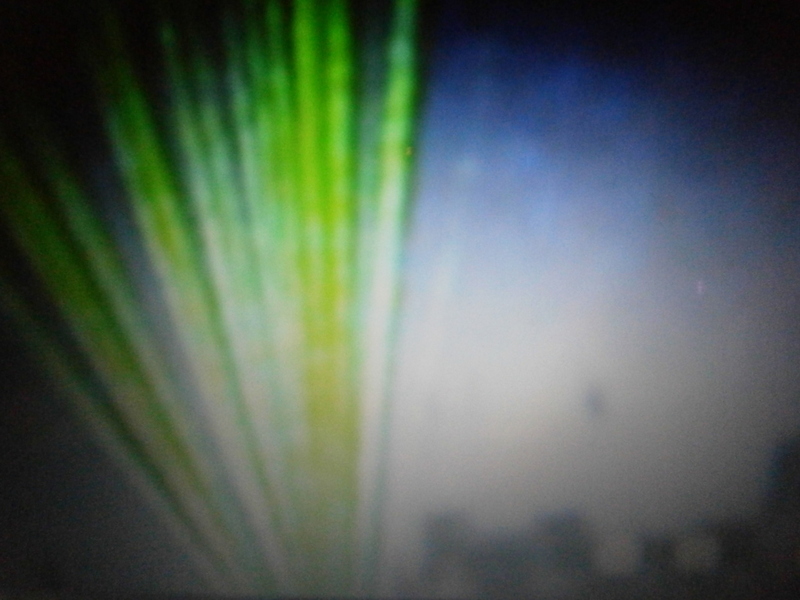 The film shows the lights of traffic going along New Cross Road, outside my window, after dark, filmed upside-down with the camera turning back to normal orientation at the end. I freely admit that I was following very much the lead of (once again, but now quite specifically) Joseph Cornell with the upside-down filming (not that I am using actual film of course, but film was absolutely made for being flipped, so that, much as I love the paintings of Georg Baselitz, I find the film re-orientations of Cornell – upside-down, negative, mirror-imaged, running backwards – far more compelling and medium-perfect), and specifically his 1942 film 'By Night With Torch And Spear' with its dreamlike upside-down footage of, I think it is, molten metal running along factory chutes in strong chiaroscuro... Well that's what it was, a total homage, and I saw after making the first version (after several takes to get the right flow of traffic), that it really had to be silent to make it more dreamlike... So several more takes to again get the right flow of traffic and, quite close to giving up, I finally got it. One marvellous thing I wasn't even trying for: the first time I showed this film to a couple of people (specifically, my parents), they didn't realize the image was upside-down until the camera rotated! I liked that. The next day I made my fourth film, the other silent remake, “WHAT COMES AFTER PLAN Z?” I filmed, after dark, a large (eleven feet long) drawing that I had made back in 2009, 'The Ruins Of Temporarycontemporary'. The drawing was draped over my bed and down and across the floor. I would move the camera across the surface of the drawing, flick the light switch to make everything go black, turn the lights back on and move the camera over the drawing again, repeatedly, varying camera orientation, manner and velocity of movement, length of pass, etc. What was nice was that I had to stretch each time to reach the light switch, so there was a nice unstable zoom out each time just before it all went black. It feels important to me that there should be plenty of black in my films. Black for me is the colour of cinema. It is not the colour of video art or of internet videos. And I want my films to be cinema. I don't want them to be art films. I don't know quite what they are so far, the ones I have made to date [I am beginning the writing of this chronicle in Spring of 2016, after having made 22 films, on a self-imposed hiatus from film-making – I am banned from making any more films until I have got the chronicle up to date and put my films online], but my ambition is to make films that stand as cinema. They don't even necessarily need to be seen in a cinema, but for the time being if they are mostly going to be viewed on laptops or whatever then it would seem like a sensible idea to get plenty of black into them and evoke the cinema that way. Anyway, to get back more specifically to “What Happens After Plan Z?”, the title was taken from one of my scrolls which can also be seen in the film, bearing the title. I have been making scrolls for the past three years (though much more infrequently since I started working on my films), with slogans painted in black tempera on lengths of white cotton, like the scrolls you often see flying through the air in old paintings. Trying to find a title for this film, I had a look through my scrolls, and chose this one which seemed rather self-mockingly relevant to my current position, starting out in film, after many years of repeatedly starting out in one art form after another (of which the drawing in the film bears testament). I think it is a pretty good film, with a good pace to it. So that was four films completed in three days. I don't remember, and my notes don't tell me, if I attempted any further filming on the final of my four days off. Generally speaking, for every film I have completed there is probably roughly one more film that I tried to make but ended up abandoning. I won't bother saying too much about these thrown out films in this chronicle. Suffice it to say, all of those files are deleted, similarly with the various takes of the films that did make it, all the other takes are immediately thrown out. And good riddance! I made my fifth film twelve days after the fourth, on 22nd September. I'll avoid the temptation of launching into a long parenthetical tirade at this point, but suffice it to say, I am one of those people who gets super-annoyed at people who take photos in art galleries. And I got really, really upset (very nearly to the point of crying) when the National Gallery the year before last decided to relax its ban on assholes taking pictures of its amazing paintings on their phones. (The National Gallery used to be my favourite place in London, I used to go there all the time, even when I wasn't intending to, if I was anywhere nearby and supposed to be doing something else, I would just find myself getting drawn back there, it was so magical that I couldn't stay away. I realize that to many people it must seem that I am making a ridiculous and hysterical over-reaction, but I have actually stopped going there anything like as much as I used to. Of course it is still a great place, it hasn't suddenly become utterly horrible, but it is no longer completely magical. I no longer find myself unable to keep away. It makes me really sad that something so magical should be thrown away so cheaply, for nothing. By the way, I kept to my promise, if I really was going to let myself fully go on a long parenthetical tirade it would be a lot longer than this one and I am closing brackets now.) Anyway, when they first brought that hideous new ruling in, I had written a long letter of complaint to the Visitor Engagement Department. The reply I'd received at the time had not been completely discouraging, they had said that the new policy was not set in stone, that they could partly understand my point of view and that they were assessing feedback, etc. Still, come last September things had not been put back right, and by now there was a new Director in place, so I decided to try writing another letter, to him. I tried to use all my powers of charm and wrote an excessively long letter in all the colours of the rainbow (the National Film Theatre had recently put on a Věra Chytilová retrospective and I had bought a pack of felt-tips in order to be able to write suitably colourful thank you letters). For more than two pages of it, I just wrote “please please please” changing colour for each iteration of the word... It took ages to write it like that, but it looked really beautiful, and so I suddenly thought that before sending it I might make a film of it. The new Director was Gabriele Finaldi, and it struck me that “LETTER TO GABRIELE FINALDI” would be a good title for a film! And also the film would be an additional protest – and we do have to keep fighting for these things! So I made a little film that same afternoon of the letter, moving the camera over the pages, moving the pages under the camera, not so that you could read more than a few random fragments in passing, but just to give a sense of the tone and the look of it. The film was supposed to be quite humorous, and the people I have shown it to so far seem to have found it funny. The letter did no good though, all I got in return was a very depressing form letter, and the cause is beginning to seem quite lost. But still, we keep fighting! In the first week of October I made two films, and slightly tweaked my strategy of making films with no editing. Out and about, I had found a couple of things to film, and I filmed them but without having any title cards prepared. On the first of the month I was riding on a bus on a bright and sunny afternoon. The name of the Polish football club Legia Warszawa had been scratched into the grey plastic back of the seat in front of me, onto which different coloured light was being thrown according to whatever was on the streets we were driving through. I filmed this for a couple of minutes, the camera held steady or bumping around according to the movements of the bus. And then, on the sixth, I was sitting in St James's Park, waiting to meet my friend Ian, a.k.a. Leg. Some geese moved past me, very close, eating some kind of bits and pieces from the grass as they walked. In the background were stacks of chained-up deckchairs that reminded me of Monet's paintings of haystacks, and I made a nice smooth tracking shot of the geese. I wondered what to do with these pieces of footage, which weren't yet finished films but which I wasn't able to edit. Soon enough however, I realized that I could in fact do a kind of editing, without having to do any digital editing. I could put the footage onto my laptop, play it back on there, and film it again off the screen with title cards (or any other kinds of manipulation) dropped in. The finished film would still be one unedited take, but ahead of making that final take I could play around with the footage in potentially all sorts of ways – a big breakthrough! Suddenly there are all kinds of possibilities – filming through mirrors, through improvised filters, anything I can think of... But even just re-filming something straight off the screen I liked the idea of. What I dislike about digital editing is that it happens in no-space and that there is nothing physical about it and no friction. By filming back off the screen, a bit of real space is introduced, ten inches of air between the computer screen and camera lens in which dust motes are swirling and variable light falling: just the sorts of things I want present in my films! So I was excited to go home that evening (the sixth) and try out my new plan. When I tried the same with the other piece of footage, of the graffito, I discovered that the technique could not be applied successfully to all types of material. The deterioration of picture quality which had improved the geese footage robbed the graffito footage of its beauty, because that of course was all down to very subtle plays of light which needed to be preserved in the highest resolution. So I was presented with a little quandary. What I decided was that it might be permissible, just every now and again, to have a film that didn't have title cards. This film, anyway, had a written phrase – LEGIA WARSZAWA – centre of screen throughout, so the whole thing actually resembled a title sequence anyway. So I decided to keep the original piece of footage as it was, and designated to it the title “BUS RIDE WITH LEGIA WARSZAWA”. The next film (or the next that I kept) was “SEQUEL: NIGHT” - the kept sequel to an abandoned film. In fact, it might even have been the third part of a trilogy... Years and years ago my friend Paul gave me a big box full of various off-cut soaps, that I have ever since been failing to quite do anything with. I had the idea to make a film, with the soaps all stacked up, and I would drop onto them glitter, talcum powder, black paint... I set the stuff up, filmed a little trailer film showing the materials in waiting, and then filmed the film... It would be like one of my performances, but without my body... The film wasn't really good enough. I went out, left the stuff on the floor so that I might perhaps try something else with it later... After dark, I filmed the stack of soiled soap by torchlight, with the torch on a flashing on-off setting. To my eyes, it looked very much like the war-footage at the beginning and end of my favourite film, Věra Chytilová's 'Sedmikrásky'; I actually didn't want such a specific reference, but reasoned that probably few others would be as obsessed with the V.C. film as am I, and so wouldn't perhaps read the image that way (in fact could be freer to read the image than I who had shot it) – so I kept that film and leave it to audiences to read it however they will. I threw out the “Soap” film, and the trailer, so now there is just the “Sequel” film with nothing extant preceding it. My next film was the first to clock in at under a minute, it was fifty seconds long and a lot of that was the title cards. I have to declare an influence here, Kurt Kren, his often very short films generally, and more specifically one film of his that I think about a lot, '27/71 Auf Der Pfaueninsel'. That one's around ninety seconds long, it's a film of a family walk, and Kren credits the whole cast in a droll, leisurely title sequence – the actual action comprises barely more than a quarter of the film's running time. It's a good joke, but also it is interesting how the film's plasticity becomes emphasized – the stick-on silver lettering, the handful of film from the walk, the physical act of editing. Because the elements are so few and because they are in such unusual balance (the titles not dwarfed by the action), you can't help but focus with extra attention upon every single detail. That is one big advantage that very short films have over longer ones. The viewer is able to concentrate on them in a totally different way. It is almost as if time stops. When a film is of a certain shortness it ceases to function as an unfolding narrative space and becomes instead viewable as a discreet object. One does not forget the beginning by the time the end is reached, the entirety is present effectively at once, in a single moment. The effect becomes less like reading a novel than like looking at a small sculpture. So I made my first sub-minute film. I had shot the footage the same day as I was working on my soap films, when I went out between making the two I abandoned and the third that I kept. I was riding on a bus, going up Vauxhall Bridge Road, and we had stopped at a stop by the National Crime Agency. On their plaza, through the plane trees, was a figure with her back to me, standing as if waiting for someone. What drew my attention was that there was a heap of apparent rubbish on the floor, very near to her, and I thought it strange that she had chosen to stand in such close proximity to the rubbish. Then I thought that it made a good composition, the figure in black, by the garbage also black, against the pale plaza, seen through the leaves of the trees. I don't often carry my camera, but I had it with me that day, and I thought I would start filming the still scene, and when the bus pulled away I would have a tracking shot: depending on whatever happened to be immediately next up the road, I might get something good for a film. So I started filming, and the bus pulled away, and into the shot came a couple of people setting up camera and lighting equipment (I hadn't seen them behind the trees) – so mystery solved! It was a fashion photo-shoot! And the rubbish on the floor was presumably clothes or equipment. And it was a really good bit of footage! So I edited it into a film a few days later (by my new technique of re-filming off the laptop screen), dropping in title cards (and showing a paused image briefly between each card). I called the film “FASHION SHOOT”. Maybe I could have made a better job of the editing, but it is what it is now: as per my policy, I immediately threw the raw footage out. I made a film on Bonfire Night, I had gone with my friend Otta (more formally, the marvellous photographer Ottavia Castellina) to see the Goya exhibition at the National Gallery. When we came out of the gallery it was late in the afternoon and dark already. Raining slightly. An anarchist group were beaming words onto the front of the National Gallery from the window of a building to the south of Trafalgar Square. It was a scrolling text, so the green laser beams were constantly moving, dancing about in the air. We stood with our backs to the projected message and just watched the green beams dance across the square. It was very beautiful! I held the umbrella while Otta took a photo, then she held the umbrella while I filmed for around thirty seconds. When I got home that evening I edited the footage into a two-minute film, “PROTEST BEAM”, replaying the same bit of film three times in different orientations and levels of close-up (upside-down, then sideways, then briefly right-way-up greatly cropped). Between each iteration I dropped a black card over the screen while I hurriedly fiddled with buttons and changed the orientation of the camera. The film turned out okay, and I did three clever things in it - (1) I engineered gold-on-black title cards by writing in white chalk and filming under electric light; (2) the original footage included Nelson's Column, which I didn't want in my abstract film, and so I initially was going to crop it out completely – but on the first take the upside-down column's black silhouette crept into shot at the right edge of the frame, and it looked like the edge of a piece of real film going through a projector slightly out of line... so when I shot the second take I emphasized this, making the black line creep slowly inwards in imitation of film going out of line; and (3) I made a very beautiful “The End” by dropping the card down upside-down then very slowly and smoothly rotating the camera in my hands until reaching the correct orientation – it looked really nice! - and when I watched the film back a couple of weeks later I fooled myself, I forgot for a moment how I had made it and thought that it was the paper rotating instead of the camera. Back in the Summer, probably July, I discovered the most amazing band – a Ukrainian pop band called Пающие Трусы. I found them on the internet, amazingly (amazingly for me, who am ordinarily such a poor surfer of the web – my mind tends to just go blank when faced with search engines and so forth, and even if there was something specific that I was intending to look up I will often forget what it was until I have turned the computer off). Anyway, I was on YouTube, looking for something else, and somehow (quite how I don't know – I certainly had been listening a lot to the Welsh band Gorky's Zygotic Mynci that Summer, and had even been looking them up on the internet, and perhaps this had helped the language to go a little haywire? - or maybe perhaps the algorithms now are just becoming spectacularly good? - but I prefer to think, and it is probably in fact the most plausible explanation, that it was just a miracle) a song came up by these Ukrainians, with the title all in this beautiful and mysterious Cyrillic script... So I tried listening to it, and it was a pretty good song. I liked it but didn't think too much about it, I turned the computer off and fairly soon afterwards went to bed. When I woke up the next morning, I found that I had the song going around in my head! I thought, maybe I liked that more than I'd realized at first... I thought I would probably like it more if I heard it again... So for the next few evenings I went back on the internet, trying to find the song. I hadn't made a note of the band name or anything (indeed, I had only been able to make out a few characters of it), so I was trying all sorts to get back to it. I spent an hour each evening looking, and on probably about the fourth evening I managed to find my song. This time I carefully copied down the name of the band. Then I taught myself the Cyrillic alphabet, using the very helpful guide to Russian-into-English transliteration in Vladimir Nabokov's edition of Pushkin's 'Eugene Onegin'. And then I was able to go back to the band name I had written down and make a transliteration into Roman characters so as to have something to type into search engines... And so I began my researches, and over the subsequent months I would spend a great amount of time on the internet, finding out about this band and about the context for them. I started tentatively at first, for it was a kind of music I was quite unused to. I would listen to a couple of songs, I'd be unsure, but then I'd find the tunes stuck in my head, I'd go back and listen again and like them more, then a couple more songs and a couple more... As the weeks went by I started to like the band more and more... The tunes were fantastic, the singing was the greatest, the production took a bit of getting used to but in time I grew to love that too (I just had to retrain my ears a bit). Meanwhile, a new show was looming at work (I think I mentioned before that I work as a gallery assistant at the Royal Academy): Ai Weiwei. I don't like Ai Weiwei! I was dreading it... But I had a very good idea. I said to myself, I need to get one of Пающие Трусы's albums on CD, then I will be able to listen to it each morning before going into work, and that will cheer me up and help to get me through the day! The only place I was able to find that sold their records was based in a German town I had never even heard of, Lengerich. So I sent to Lengerich for their second album, 'Интимнепредлагать'. It arrived two days before the show opened. The show, indeed, was very bad (it was probably even worse than I had been expecting) – but the record was incredible! It did help, but still it was difficult spending whole days at a time in that exhibition surrounded by such bad work. It soon became apparent that I was going to need all three Пающие Трусы albums to get me through the Ai Weiwei exhibition! So I sent to Lengerich again, for the other two, and thank heavens they arrived quickly. And as soon as I had all three albums, I felt that Ai Weiwei was now powerless to get me down with his rotten sculptures! Whenever I was in there I would sing those songs in my head, and I was happy! And in fact, the juxtaposition of those sculptures with those songs was so comical that the whole situation just became very funny... I remember one day I was in there, with large crowds of people very earnestly looking at these dreary art works, and I was singing to myself these wonderful songs, and I suddenly thought, I must be having a much better time than any of these people! and I just started laughing. So finally, the whole Autumn was a great joy, in spite of that dreadful show. I made the film a few weeks before the show finished, on one of my days off. I filmed some Пающие Трусы-related paraphernalia spread out over a black cloth: a drawing of the chorus to the song 'Как Алла' coming out of a boom box, the three CDs, some of my research notes, and a couple of mix CDs of their songs I had made for friends. I wish I had made nicer title cards, but other than that it's a fairly decent film. I made “How I Got Through The Ai Weiwei Exhibition” on the afternoon of 17th November, and I completed the films “SEA DEVIL” and “SEA DEVIL 2” on the evening of the same day. I had shot the footage two days previously, when I had been intending to go and visit my friends in Winchester (Ben & Rachael & Eva & Isaac). At Waterloo Station however I discovered that no trains were running that way (it eventually transpired that someone had jumped under a train and that was why). So, it being a bright and pleasant morning, I took a walk along the Thames. Because I'd been intending to show my friends the films that were on my camera, I had the thing with me, and I soon found something to film. Some workmen were (I think) dismantling part of an old bridge, and their crane was mounted in a boat that was named Sea Devil. Sparks were periodically cascading from where the man at the top was (I think) cutting through metal. Very beautiful and spectacular! I filmed a little of it, and a little more a few metres down the river. This was the first time I had used the zoom function on my camera (I kept my distance, I felt that maybe the workmen might not want to be filmed so I did it discreetly). I edited the first bit of footage into the film “Sea Devil”, re-filming off the laptop screen and dropping in title cards in my by now traditional manner. The second bit of footage was made into the much shorter “Sea Devil 2” (30 seconds!) - I cropped the image much more severely, losing the name on the side of the boat and background river traffic, and just focussing on the pouring sparks. So there were my first two action movies! Two days later I completed the film “THE FIRST FEW SECONDS OF WINTER”, that I had begun work on a week before. I had been thinking about making a film where, rather than simply re-filming footage off the laptop screen once, I would put the re-filmed footage on the screen, re-film that, and so on and so on, so that the picture would progressively deteriorate and I would hopefully reach some nice effects... (I'm sure it has probably been done already, it's an idea that I imagine has probably been done before in many different art forms.) It happened that one day I met up with my old friend Maria, for the first time in a very long time, and we met in Regent's Park. I am normally extremely bad when meeting up with friends at saying where we should go, but for once I came up with a good idea, that we should go to this park I hardly ever go to, on what was the most glorious of sunny Autumn afternoons... We sat on an outside table of a café by the lake, and as we sat the weather turned, the sun went away and it became cooler and cooler and finally very cold, it felt as if the seasons had changed there and then and that Autumn had given way to Winter (in subsequent days the Autumn warmth returned, but still it had been a poetic moment). As we walked back along the edge of the lake, I told Maria about my plan for the film with footage deteriorated over several generations of re-filming, and asked if she would like to be the subject (I was walking land-side, and the lake background looked good behind Maria). She consented, but wanted to get her scarf straight before shooting could commence, and this took an age of fiddling as we continued to walk along, so that I began to fear that I would lose my background... It's quite a long lake however, and when Maria was ready the shot still looked good. I filmed for around forty seconds as we continued walking (though I used less in the final edit) and as soon as I started filming she recommenced with the adjustments to her scarf – this looked great on film however, lending much more movement and interest to what would otherwise have been just a head in profile going by a lake. It really made the film – and the film in fact ended up being a quite different one to what I had originally envisaged. I tried, as a gradual process over several evenings, the re-filming and re-filming, but found that the best version was the third-generation version. In that version, the colours of the original had all consolidated into a general and wonderfully rich and icy blue that captured perfectly the season-shifting coldness we'd felt that afternoon. In subsequent generations of re-filming, the image remained much the same but merely diminished in quality, its almost liquid appearance replaced by a less attractive grittiness. So I abandoned my experiment in abstraction and decided instead to just make a lyrical film about the arrival of Winter. I went back to the second-generation version and re-filmed that with title cards added. I wish now I had made another take, to get the movement of the title cards a bit smoother, but other than that I'm very happy with the film (and Maria was happy too). And after completing (for the second time) four films in three days, I didn't do any more for a while... I filmed various things in December, both in London and on a Christmas visit back home to Somerset, and some of them I tried editing into films, but none of it worked. One day over Christmas my parents and I went to a beach on the ever-collapsing Jurassic Coast, and a recent landslip had exposed an old rubbish tip, so that various items buried for maybe fifty years were now scattered over the beach. One object looked very much like a treasure chest, and I filmed it moving around it in a circle. I thought I might make it into a film that was like a fragment of an island adventure movie... But I hadn't filmed it well, I had rushed the movement and I had filmed from closer than I should have done, the footage was unusable. My first film of 2016 was “SCOURGES”. It shows my old sculpture 'Scourges (Blood Red)' (2010) that I have installed in my flat, just above where the kettle is. When I boil my kettle, the rising steam causes the thongs of the scourges (in reality, appropriated fringe squawkers blu-tacked in a line to the wall) to move about in the air. So I made a little film of that, on a sunny morning, the sculpture in movement. Briefly and accidentally, part of another sculpture appears on screen, to the left of my scourges: it is by Caline Aoun, from 2009, from her series 'When Sunlight Bounces Off'. Next I made my first animated film, “PLANS FOR LATER ON”. (I told Otta, who'd held the umbrella when I was shooting “Protest Beam”, that I'd made an animated film, she said, Oh, you are getting professional now, I said, I said I've made an animated film, I didn't say it was professional... The technique is basically that of Bob Dylan in the 'Subterranean Homesick Blues' video where he is tossing away the sheets of paper with the words on.) A few years ago (four to be precise), we had a show at the RA (I definitely did by now mention that I work there) of David Hockney. I'm still not quite sure if it was a good show or not; I felt differently about it on different days; that work was very easy to like, and very easy to dislike; mostly I did like it, but without being sure it was great; what was best in it actually was the room of his films (which you needed to watch many times over – which you can when you work there – and puzzle out). Anyway, it was super-popular, we had extended opening hours to cope with the crowds, and I was working around sixty hours per week (in the final week I worked sixty-six) – so I had more money but less time. I spent the extra cash on art books: I bought lovely books on Lorenzo Lotto, Joos van Cleve, Carel Fabritius, Nicolas Poussin, Jan Brueghel's collaborations with Rubens, and the collection of Dennis Mahon. As for my time, I realized I would have to organize myself if I was going to get anything done creatively in this spell of working long hours and splurging on books – so I set myself a single project, that I would work on during my free moments during the run of the Hockney show. I'd had the idea a while before in fact, to make a series of drawings of myself being eaten by various animals, but had never got around to carrying it through. So, taking the one decent drawing I'd made when I'd first had the idea two years before, I started adding variations until, by the time the Hockney'd ended, I had a round twenty. (As I was at the same time throwing myself more than ever into the study of Old Masters through the books I was treating myself to and museums I was visiting on my days off, I borrowed a lot of the animals and some of my poses from old paintings, and made a thing of this in the suite.) And then I made a book, one of the best books I've made, of the whole series of drawings, 'My Funeral Plans'. (The singer Serafina Steer is a fan of this book and if you don't know Sefa Steer you should listen to Sefa Steer – you'll quickly be a fan of hers...) Well, so, (oh, long stories! spit it out! and I assure you I'm shockingly un-garrulous in person) I – oh god, I realize this is going to be another digression – I was supposed to be having a solo exhibition, with more than 150 pieces in it, and it was going to be called 'What It's Like In Heaven', but then the gallery fell through and so my (what was going to be the inaugural) show fell through... And I had meanwhile made, especially for the gallery-to-be's window, a very big version of one of the images from the 'My Funeral Plans' book, showing my severed head and a bird perched upon it with flapping wings and a bit of my meat in its mouth, to which I had given the title 'Plans For Later On' (I was thinking, after-party of the private view...) And in between the little drawing in the suite & book and the massive drawing for the abortive window, I had made a squared-up drawing and taped it to the wall beside my bed... So often in mornings, lying in bed, I've had chance to contemplate this sketch (I wouldn't want a studio separate to my home), and eventually I formed the idea of re-making that image as an animated movie... I wondered for a while if I should, then one afternoon decided to give it a go and started working very quickly... I drew, in charcoal, twenty-six drawings in the space of about half an hour, showing the bird approaching me, taking some meat in its beak, swallowing, taking another bite of meat, taking to wing, and landing on my head. I then tried shooting the film, making several takes, flicking through the individual drawings at different speeds trying to get the right rhythm, but I couldn't get it quite right. Also, in fact, the title card at this point read “My Funeral Plans”, borrowing from the book title, whereas I saw on reviewing my takes that it ought to be, borrowing from the window-drawing title, “Plans For Later On”. So I had another go two days later, changing that title card and also throwing out three of the drawings to make the film a little leaner and punchier. I shot several more takes before I finally got one with the correct pace. One of my very first film ideas, sketched out in my notebook back in the first week of September when I hadn't even tried filming anything yet, was for a film called “LETTERS FROM LEONAY”. It would be a film of all my mail (more than a decade's-worth) from one of my very dearest friends – not anybody called Leonay (as everyone to whom I've shown the film or its poster seems to assume) but Belinda who was in London for not much more than a year 2002-ish as the relatively sticking end of a pan-European jaunt before returning, visa expired, to her native Australia. Leonay is the name of her home town (near Sydney), and the first few letters I had from her following her return were from that town, though the bulk of them would be from either Sydney proper or from Melbourne – it seemed to me though that “Letters From Leonay” would make a good name for a film, so the film's called that. I tried many times to make this film – many takes across three separate sessions, across the months. Finally, mid-January, I got an acceptable take. It's a rough production, but it has some neat touches. One long letter of Belinda's was written in an old spiral-bound notebook and I filmed that with my fingers just out of shot turning the pages and it looks like a scene from a ghost-story movie where the book-pages turn themselves – I like that bit. I perhaps ought to credit the painting that appears in the middle of the film revolving as I rotate the camera above a postcard reproduction: it is by John Olsen, 'Sydney Sun' (1965). And the image reproduced on the cover of the one-song mix CD that Belinda sent me one birthday and which also can be seen in the film is 'Street' by Josef Prǒsek. Next I started work on a film that gave me a lot of trouble, “Bohemia Grove”. In the RA's public toilets there had appeared, towards the end of 2015, on the back of one of the cubicle doors, some very strange and elaborate conspiracy-theory graffiti. There was a grid structure filled with short phrases: “Skull and bones”; “Bohemia grove”; “House of Wolves etc”; “Queen of England is a reptile”; “House of parliment (sic) is full of pedos' (sic)”; and so on. Above was a pyramid containing words and numbers and seeming to describe some sort of secret hierarchical power structure; and to the side of this was some rambling prose having to do with the coming end of the world and the real existence of the Devil (who wants you to think he “is unexisting” as that suits his purposes very well). One Friday evening, at work at the RA, I started to think about how I might make a film of the graffiti. I made some sketches in my notebook and soon worked out a full and detailed plan for the film. The film would for its title borrow the phrase “Bohemia Grove”, which means I don't know what, but I like the mystery of not knowing and think it sounds like a good title. The title cards would be written on sheets of toilet paper in the wall-mounted dispenser (LEONARDO-brand – the ones in the RA staff toilets are a brand called DA VINCI – there is maybe a film, or something, to be made of this...), and I would smoothly unspool the toilet paper so that the phrases “Young Mountains present”, “a film by Duncan Ward”, “Bohemia Grove” scrolled neatly down the screen; then I would pan back to reveal the dispenser that the titles had been scrolling out of; then across to the graffiti on the door; then I would move the camera in to show the text in close-up phrase by phrase; and finally I would pan over to a “The End” card written on the toilet paper in the dispenser's second berth. I wrote a note-to-self in the notebook, urging me to act fast and make the film before the graffiti got cleaned off. And when I came to work on the Sunday I brought my camera... and the graffiti was already gone! It looked as though it had been cleaned off that very morning. Parts of the text could still be faintly seen, but parts were completely lost... There wasn't a lot left to film - I had lost my movie. “Bohemia Grove” lost, I went around that day feeling pretty sorry for myself; but in the end I determined to make another film that day as a kind of compensatory treat. And so I made the film “MERRY-GO-ROUND”. There is a merry-go-round permanently on the South Bank of the Thames, between Westminster and Waterloo Bridges (a couple of minutes' walk from where I have my brandy ritual), and I decided to stroll down there after work and to make a film of it. I am very fond of merry-go-rounds, it must be thirty years since I rode one, but the sight of them always cheers me. I sat down some distance from the ride and filmed it in motion using the zoom. This meant that the image was frequently punctuated by the figures of people walking between the merry-go-round and me, silhouetted against the turning lights or even blotting them out entirely for a moment and making the whole screen go black. Back at home that evening, I put the footage into my laptop and made it into a film by re-filming off the screen and dropping in title cards. I cropped the image a fair bit to focus more on the rhythmically moving lights (somewhat saturated thereby and off-focus), and I had the image moving for a while behind the semi-translucent yellow title card before moving the card away. This was all good; what was less great was that, in filming again off the laptop screen, the clean black of the silhouettes of the passersby was converted into a less appealing blue. Also, you can see my camera reflected in the darker parts of the image. With my technique of re-filming off the screen, some colours and types of image lend themselves more successfully to the process than others. I have yet to find a way to re-film black without getting the most atrocious reflections. I had some great footage of a petrol station at night, shot in December, that I had to give up trying to turn into a film because of this problem. As for my merry-go-round film, I kept it with its black-turned-blue and its reflections, as being about the best I could manage within my self-imposed technical restrictions. It's a flawed film then, but one that did cheer me up after losing my “Bohemia Grove”. Also I felt happy to have made a film of a merry-go-round since it fit with my plan that film could be the medium in which I could find room for the full and wide range of my interests – I don't know how I would ever have made a merry-go-round the subject of a work in any of the other media I have worked in, but it felt simple and natural to make one the subject of a film. I made one more film in January, still more quickly and spontaneously, “BLINDS”. At about one o'clock one day the sun was shining very brightly into my flat through the closed blinds. I had an idea to film it, spent around ten minutes working out how to go about it and scrawling out a few title cards, and got it in one take. I turned my camera sideways, stood back a little but with the zoom on, and filmed straight into the sun. I kept the camera constantly moving up and down so that what appears on the screen is a frantic rolling of flickering vertical bars. With the zoom on and the camera moving fast, it was quite tricky to get it to land properly on the “The End” card (taped to the blinds near the bottom) – I actually did land it quite tidily, but it looks somehow unlikely, like film of movement coming to a neat standstill because it has been run backwards – I liked that. My next film was also made at home, out of the other window. One night there was a big storm with torrential rain. Rain was pouring down the window, and pooling onto the flat roof below. I got my camera out, filmed a 45-second test shot of the rain going down the window with the background blue and purple lights of the music studio across the street seeming to dissolve and reform in the sliding water, then taped some title cards to the window and started filming multiple takes, placing different emphasis on the various interesting sights – the coloured lights through the water, the traffic along the wet road, the raindrops hammering into the roof-puddle that reflected the street-light above it. The various takes all had interesting things in them, but none really made a satisfying film. After thinking about it for two or three days, and watching it all back several times, I decided to throw out all of the takes and just keep the test shot. It was a very beautiful bit of filming, exquisitely beautiful, the most beautiful thing I had filmed. It looks to me a little like looking through streaming tears, if you could keep your eyes open. Or a faster version of a phenomenon I remember being told about on a primary school visit to a church, that I have never since heard mention of elsewhere and am not 100% certain that I didn't just dream, that over a period of centuries glass can very slowly slide down itself, so that it becomes fatter at the bottom than at the top. I realized that it would be pointless even trying to edit in any titles because, as with “Bus Ride With Legia Warszawa”, the image would be robbed of all its subtleties. So I decided that, for the second time, I could let a piece of footage without titles just stand as a finished film in its own right. And actually it is such a nice image, I find that I rather like that it is not encumbered with any titles but left to stand alone. I designated it a title of “STORM FRAGMENT”. Meanwhile I was still thinking about my “Bohemia Grove”... I really wanted to make a film with that title. The film I had originally envisaged was no longer possible since the graffiti was wiped off, but I started to wonder if I might perhaps make a film based on a transcription. I revisited that toilet, scrutinized the remnants. Parts of the text were still legible, parts were semi-legible, parts were entirely gone. Over a few visits I transcribed what could be read, studied the remaining bits of ink from the parts more thoroughly scrubbed, and attempted to reconstruct what was missing by a combination of my memory and what could fit the gaps; some of what was missing I was able to summon up, but parts of it though I could recall the gist of it I couldn't find the precise actual wording. There was probably about enough though to make a transcription film of, though there would be blanks. And actually, I thought the blanks would not be such a bad thing because they would make such a film look scholarly, though I realized I should not make it look over-scholarly since that could just come across as arch. And so I started at last the shooting of “BOHEMIA GROVE”. Still I had problems... After outlining a few different ways of doing it in my notebook, I decided that the best way would be to type the text onto my laptop, typing with my right hand and filming the screen with my left, and immediately after typing out each discreet phrase I would press down on BACKSPACE and the phrase would be deleted ready for the next to be typed out in its place. It would look rather like a conspiracy theorist thinking about an utterance, self-censoring, trying out another one, and so on, over and over (and moreover, aesthetically, it would just look very nice). So I put my notes beside the computer and started filming and started typing, and indeed it did look very nice. Unsurprisingly there were typos, but I was ready to go through a few takes before I got it right. The problem though was that once I had made a couple of attempts the word processing programme on my computer started to recognize what I was typing and offered, in white letters in blue rectangles, autocomplete suggestions (I think that is the correct name for it) and this did not at all look nice. I tried to turn the autocomplete function off, but couldn't work out how to do it. So I had to give that up and find another way to make the film. Thinking about it some more, I decided that the next best plan would be to type the whole text in advance with each phrase on a separate page of a document, so that by simply clicking on the arrow to go to the next page I could bring the next phrase up and each in the same place on the screen. There wouldn't be the phrases being letter-by-letter written out and then deleted, but at least it would be less difficult work and I wouldn't get those blue boxes on the screen. So I did it that way and finally, after more than a month, I had my film. It is hard for me to judge how good it is – certainly the finished product falls short of more than one of the visions I had in my head and notebook for how the film should be – but then again, if I imagine somebody coming to the film fresh without any idea of what to expect from it or what it might be about, I think it might possibly be a strange and mysterious film - that's what I'm banking on anyway. First I made a little book, also entitled “Bohemia Grove”, comprising the transcription of the graffiti and my notebook notes for the film (because I'd had more problems making that film I also had more in my notebook to make a book of). Young Mountains published it in an edition of 16 copies. After the transcription and the notebook pages there were a few pages in the book left over, so in order to fill them I made three collages from photocopied fragments of the notebook notes. The collages looked like film posters! So that gave me another idea. I made posters for all of my other films, working very quickly, and in the space of the last six days of February I created posters for all the twenty-two films. Young Mountains published, in an edition of 25 copies, the book 'Film Posters: Volume 1', which was in fact Young Mountains' fiftieth publication, and maybe the best. It's a very good book! Those film posters turned out really well, in many cases the posters are in fact better than the films they herald. In some cases, though it may be a little perverse, I would say that the nice poster justifies the existence of the ropy film, as providing an occasion for the poster. More generally, I'm aware that even my better films may seem somewhat slight, and having the poster to stand alongside them it helps to maybe bulk them out into more substantial filmic entities. Again perhaps perversely, I had designed the posters less with an eye to blowing them up over walls than to reproducing them in the book – ergo they are all a little less than A5 and steer clear of large areas of dark colours that would cost me too much in copier ink. But it made a great book! Really wonderful! And in fact, since it doubles as a filmography, I find the book very useful because, making so many films, it is a little difficult to keep track of them so I find myself consulting the book as a reference a lot. The film posters book printed, I ought next to have turned my attentions to putting the films online, but again I got sidetracked... I had the idea of writing this chronicle. And of course I thought that I should have the chronicle ready to go online at the same time as the films, so I would need to write the whole chronicle first. It was very slow going to start with, and very difficult to get the right tone. (Hopefully I found it in the end and indeed if you are still reading by this point then I presumably must have done, and if I failed to then possibly I am the only one still reading...) Also it was difficult because, having started work so quickly and suddenly in September, there were so very many things to say all at once, and it was tricky to organise it all. On about the third session of attempted writing, I suddenly saw the way to proceed, I saw that I should put the last Velvet Underground album, 'Loaded', on and this would get me into the right sort of rhythm and frame of mind to enable me to write the chronicle. Instantly it worked! Still I wrote slowly, but now I wrote more surely, and since then I've continued, slowly but surely. One day I filmed something, but didn't edit it into a finished film because of the self-imposed ban. Once I have my first films online and am allowed to make new ones again, I will make the footage into a film, hopefully. It was a Sunday, and although I almost invariably work Sundays, May is a time of year when it is always slack at work and I have lots of time off (I have been doing my own work! making many sculptures! and writing the chronicle!) I had stayed up late, woke up late, sculpted a little, walked to nearby Telegraph Hill Park. It was raining lightly, and then somewhat more heavily. I sat under a large and leafy tree and smoked one of the little cigars my father had given me, in a very charmingly customised packet, for Christmas (I am a very slow smoker and this was the fourth of five little cigars in that packet, second packet still to follow); and then I took my exercise book out and carried on with a long letter I was writing to my friend Laure in Paris (rue du Télégraphe, in fact, in the twentieth), but after a while the rain, which was beautiful rain, became so heavy that it was coming right through the tree's thick foliage and onto the paper to the extent that it became impossible to continue with the letter. So I put up my umbrella and walked home. Back in my building I went into the shared kitchen and found evidence of a seemingly wild and successful party (though I'd heard nothing in the night) on the flat roof out the window – empty bottles, empty cans, discarded underwear – which had either been tossed out of the kitchen window or, more likely, out of the flat directly above. And by now there were also big puddles of rainwater lying about amongst these souvenirs. The whole tableau looked great, and so I got my camera and filmed it. There is a grille on the window which made filming a little awkward, and also I'm afraid I was rather rushing it since I was conscious that whoever's party it was might come along and see me with the camera and think that I was photographing it in order to make a complaint to the landlord – but I got a bit of footage and hopefully will be able to turn it into a film, in which case I'll call it “Party Fallout”.